Information and results from consultations which have taken place and are now closed. By law the Board must have a gambling policy statement setting out how it will carry out its legal functions in relation to gambling in West Lothian. West Lothian Licensing Board's current Gambling Policy Statement came into force on 31 January 2016 and will expire on 30 January 2019. The consultation carried out between 20 April 2018 and 20 June 2018 has now closed. A list of gambling premises [34kb] licensed in West Lothian can be downloaded. By law the Board must have an alcohol licensing policy statement setting out how it will carry out its legal functions in relation to alcohol licensing in West Lothian. West Lothian Licensing Board's current Alcohol Licensing Policy Statement came into force on 31 January 2013. The consultation carried out between 14 May 2018 and 14 July 2018 has now closed. You can view the Board's current Statement of Licensing Policy [986kb]. Young carers should be made aware that they are entitled to be children first and that the Act applies to them. Unpaid carers are people who provide help and support to someone they know, such as a family member or friend, but who are not employed to do this or working as a volunteer for an organisation. Unpaid carers are the largest group of care providers in Scotland providing vital support to the people they care for. Carers should be recognised as equal partners in care and have the opportunity to be involved in the support planning of the people they care for. Carers should also be able to decide how much care they wish to offer and to know what support is available to them. West Lothian must also prepare a local Carers' Strategy and a Short Breaks Services Statement. West Lothian is seeking the views of carers, the people they support, organisations and anyone else who would like to contribute, on the draft eligibility criteria for carer support. We would particularly welcome the views of carers as the criteria will be applied to them. View and download the draft West Lothian eligibility criteria [83kb]. A summary report on the response to the consultation will be issued on completion. It is expected that West Lothian Council will have to make estimated savings of £73 million over the next five years, resulting in changes to local services. Like all local authorities West Lothian Council is preparing for the significant financial challenges which lie ahead. The council continues to see an increase in demand for services which is combined with reducing budgets. This is expected to result in a significant budget gap of £73 million over the next five years. Your views will help the council to make informed decisions on the issues which reflect local priorities, identified by communities. An Air Quality Management Area (AQMA) for Broxburn was declared in March 2011 due to exceedances of both Nitrogen dioxide (NO2) and fine particulates (PM10). As part of the declaration process West Lothian Council made an AQMA order for Broxburn. Further information can be found in the AQMA. Road traffic, principally cars, is the main source of pollution in central Broxburn. The Air Quality Action Plan (AQAP) for Broxburn is being consulted upon before adoption by the council. After the Air Quality Action Plan for Broxburn is finalised, funding will be sought to implement the action plan measures. Information regarding the Broxburn Detailed Assessment can be found in the Broxburn Detailed Assessment [2Mb] . The Broxburn AQMA order and AQMA map can be found in the AQMA order for Broxburn [248kb]. Prior to publishing the finalised Air Quality Action Plan (AQAP), a 6 week public consultation is required. The finalised AQAP for Broxburn will be subjected to wide consultation, both internal and external. This will include transport operators, local residents, community council, local businesses and elected members. The feedback from the consultation will shape the finalised action plan and the priority given to each measure. The finalised Action Plan will list the measures considered worthy of pursuit and detail timescales for their implementation. The consultation will run from 29 September 2017 - 10 November 2017. The finalised AQAP for consultation can be accessed here [1Mb] or via the 'related documents'. West Lothian Council is seeking the views of local residents on the future management of the Regal Community Theatre in Bathgate. The council owns the B-listed art deco former cinema building at the heart of Bathgate, and has been managing the building since the previous board went into liquidation. Three proposals have been put forward for the future management of the Regal as a community resource, and the council would like to hear the views of local residents on the proposals. Residents are being asked to express their views on the three options in the survey, with 1 being their preferred option and 3 being their least favourite. These Outcomes set out the Council's approach as an employer, to its customers; democratic and public involvement and participation; and the reduction of inequalities across West Lothian. The Council is now developing Equality Outcomes and an Equalities Mainstreaming Report for the period 2017-2021. In order to ensure that the services of the council meet the needs of our diverse communities, we are inviting you to take part in a consultation exercise to influence the Equality Outcomes that the Council is required to set for the coming four year period of 2017 - 2021. Based on feedback we have received we have made small changes to the Outcome wording to hopefully make them more meaningful. It was agreed at a meeting of the Development and Transport Policy Development and Scrutiny Panel on 6 February 2017 to consult on updated Supplementary Guidance (SG) on flooding and the water environment. The guidance has been prepared to update and refresh the council's current Supplementary Planning Guidance 'West Lothian Flood Risk and Drainage' adopted in 2008. Flooding can have a detrimental impact on people, businesses and the environment. West Lothian Council is committed to reducing the vulnerability of existing and future developments to flooding. Through the planning system, we will aim to prevent development that would have a significant probability of being affected by flooding or would increase the probability of flooding elsewhere. avoidance of increased surface water flooding through requirements for Sustainable Drainage Systems (SUDS) and minimising the area of impermeable surface. This Supplementary Guidance on flooding and the water environment has been produced by the council in order to explain how particular development plan policies should be applied in practice (in particular, policies EMG1, EMG2, and EMG3 of the emerging West Lothian Local Development Plan). It was agreed at a meeting of the Development and Transport Policy Development and Scrutiny Panel on 3 April 2017 to consult on updated Supplementary Guidance (SG) on Air Quality. Policy EMG 4 of the emerging Local Development Plan requires developers, where appropriate, to provide additional information on the impact of their proposed development on air quality. This Supplementary Guidance on Air Quality has been produced by the council in order to explain how particular development plan policies should be applied in practice. When an air quality assessment is likely to be required. What should be included in an air quality impact assessment. Mitigations of air quality impacts. West Lothian Council is committed to ensuring that health based air quality standards are achieved to protect the health of our citizens. The council has a responsibility through the planning system to ensure no new pollution hotspots are created or no significant new human exposure is introduced where there could be existing poor air quality. Air quality across West Lothian is generally very good in that pollutant concentrations are within the health based air quality objectives at most locations. At locations where regular exceedances of the Scottish air quality objectives are known to occur and human exposure is present, the council is required to declare an Air Quality Management Area (AQMA). To date, three AQMA have been declared in West Lothian. These are located in Broxburn, Linlithgow and Newton. Road traffic emissions are the main source of pollution in Broxburn and Linlithgow. In Newton domestic combustion contributes a significant proportion of particulate emissions. It was agreed at a meeting of the Development and Transport Policy Development and Scrutiny Panel on 26 October 2015 to consult on revised Residential Development Planning Guidance. Supplementary Guidance (SG) is produced by the council in order to explain how particular development plan policies should be applied in practice. This particular SG seeks to ensure a consistent application of policy and to provide a design framework for all who are involved in the provision of new residential development within West Lothian: it brings together all the elements that help contribute towards cohesive housing layout design. It promotes and encourages high quality and innovative housing developments that are visually attractive, well integrated into their surroundings, designed on environmental sustainability principles and which offer a good standard of amenity to new and future occupants while also protecting the amenity of existing residents. The current RDG (and companion guidance on small scale residential development) are being refreshed and consolidated, principally to ensure that they reflect and are consistent with the latest Scottish Government policy guidance, but also to enable references to legislation and supporting documents to be updated. Once approved they will form part of the statutory supplementary guidance supporting the West Lothian Local Development Plan (LDP). A period of public consultation ran from 1st November 2016 for six weeks (until 13th December) on the concept of Quiet Roads. The council invited communities and route users to offer their views on selected routes considered to date and other routes they would like to suggest as potential Quiet Roads via an online survey and online mapping tool. Static exhibitions with some paper surveys were presented at Beecraigs Country Park Visitor Centre, Stoneyburn Community Centre and the West Calder and Harburn Community Development trust office at Union Square, West Calder. The results of this consultation and proposed next steps, if appropriate, will be taken to Elected Members in 2017. Further information can be found on Quiet Roads. An Air Quality Management Area in Newton was declared in July 2016 due to exceedances of fine particulates (PM10). The next stage will be to carry out an assessment to provide the technical justification for any proposed measures to include in an Air Quality Action Plan (AQAP). This further assessment will run in parallel with the development of the action plan for Newton. The action plan will focus on effective, feasible, proportionate, and quantifiable measures to reduce air pollution in Newton. 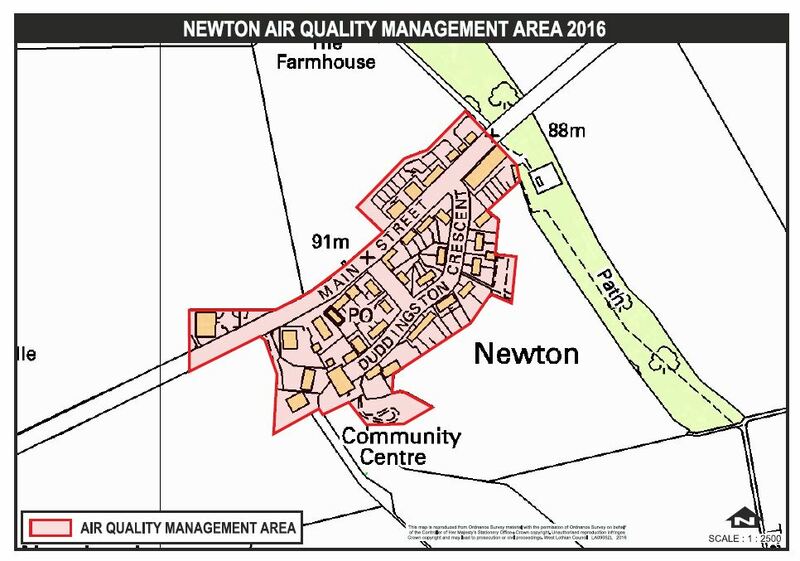 A Detailed Assessment of Air Quality in Newton has been carried out. The report has now been finalised and encompasses modelling of PM10 . The key purpose of the report is to assess the magnitude of any exceedances of the PM10 annual mean objectives at locations that relevant human exposure may occur. The 2 main sources of PM10 emissions in the Newton area are fuel combustion and road transport. There are exceedances of the PM10 annual mean Scottish Objective in most of Newton. Non road-traffic PM10 concentrations account for a significantly high proportion, up to 91.3% of total PM10 concentrations within the study area. The contribution from road traffic to PM10 concentration is higher for the receptors closer to the road. When only comparing the contribution of road traffic and domestic fuel combustion, the largest contribution at each receptor comes from domestic fuel combustion. The contribution of domestic fuel combustion goes from 50.2% for receptors closest to the road up to 92.6% for receptors further away from the road, excluding the background contribution. More information can be found in the Detailed Assessment of Newton [910kb]. In light of the Detailed Assessment of Air Quality in Newton using the available monitoring data from 2014, West Lothian Council is required to declare an Air Quality Management Area for the exceedances of the Scottish PM10 annual mean objective. A consultation on the proposed AQMA for Newton ran from the 16 May 2016 to 20 June 2016. The views gathered during this period were considered. 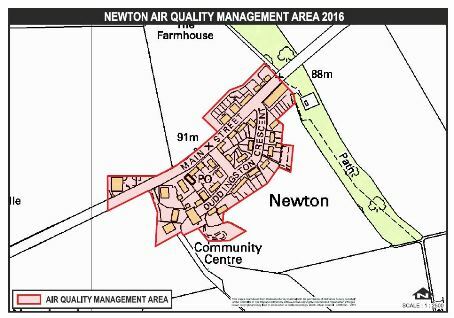 An Air Quality Management Order was drafted and finalised in July 2016 declaring an Air Quality Management Area (AQMA) for Newton due to exceedances of fine particulates (PM10). More information can be found in the AQMA Order for Newton [276kb]. The boundaries mirror those in the West Lothian Local Development Plan Proposed Plan. Air Quality Map - Newton Displays a larger version of this image in a new browser window. An Air Quality Management Area in Linlithgow was declared in April 2016 due to exceedances of both Nitrogen dioxide (NO2) and fine particulates (PM10). The next stage will be to carry out an assessment to provide the technical justification for any proposed measures to include in an Air Quality Action Plan (AQAP). This further assessment will run in parallel with the development of the action plan for Linlithgow. The action plan will focus on effective, feasible, proportionate, and quantifiable measures to reduce air pollution in Linlithgow. A Detailed Assessment of Air Quality in Linlithgow has been carried out. The report has now been finalised and encompasses modelling of both PM10 and Nitrogen dioxide. The key purpose of the report is to assess the magnitude of any exceedances of PM10 and Nitrogen Dioxide annual mean objectives at locations relevant human exposure may occur. NO2 concentrations in excess of the 40 μg.m-3 annual mean objective occurred at 342 High Street where the predicted NO2 annual mean concentration is 40.6 μg.m-3. Annual mean PM10 concentrations in excess of the 18 μg.m-3 Scottish objective occurred at several locations along High Street including 10 residential properties. More information can be found in the Detailed Assessment of Linithgow [2Mb]. In light of the Detailed Assessment of Air Quality in Linlithgow using the available monitoring data from 2014, West Lothian Council is required to declare an Air Quality Management Area for the exceedances of the Scottish PM10 annual mean and Nitrogen dioxide annual mean objectives. A consultation on the proposed AQMA for Linlithgow ran from the 7 March 2016 to 7 April 2016. The views gathered during this period were considered. An Air Quality Management Order was drafted and finalised on the 25 April 2016 declaring an Air Quality Management Area (AQMA) for Linlithgow due to exceedances of both Nitrogen dioxide (NO2) and fine particulates (PM10). More information can be found in the AQMA Order for Linlithgow [758kb]. The boundaries mirror those in the West Lothian Local Development Plan Proposed Plan. This includes Linlithgow, Linlithgowbridge and land allocated for development. 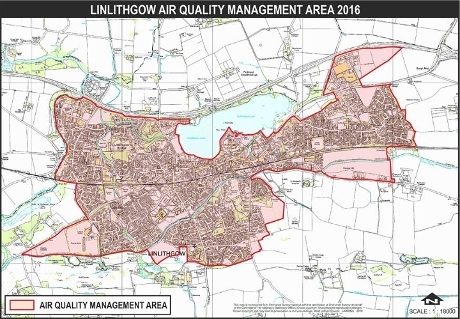 Air Quality Management Area (AQMA) Map Linlithgow. Displays a larger version of this image in a new browser window. West Lothian Council is required to regularly review and assess air quality. Where exceedances of any air quality objectives are considered likely, the local authority must then declare an Air Quality Management Area (AQMA) and prepare an Air Quality Action Plan (AQAP) setting out the measures it intends to put in place in pursuit of the objectives. An Air Quality Management Area (AQMA) for Broxburn was declared in March 2011 due to exceedances of both Nitrogen dioxide (NO2) and fine particulates (PM10). More information can be found in the Broxburn Detailed Assessment [2Mb] . As part of the declaration process West Lothian Council made an AQMA order for Broxburn [248kb]. Road traffic, principally cars, is the main source of pollution in central Broxburn. An Air Quality Action Plan for Broxburn has now been drafted following the declaration of the AQMA. Prior to publishing the Air Quality Action Plan, a 6 week public consultation took place between 7 March 2016 and 18 April 2016. The draft Action Plan for Broxburn was subjected to wide consultation both internal and external. This included transport operators, local residents, community council representatives, local businesses and elected members. The consultation has now ended and the feedback is being considered. The comments received will shape the finalised action plan and the priority given to each measure. As the consultation period has now ended, West Lothian Council is not seeking formal comments on the draft measures to improve air quality.The finalised Action Plan will list the measures considered worthy of pursuit and detail timescales for their implementation. More detailed information is available in the Draft Air Quality Action Plan Broxburn [1Mb]. Appendix 1 details the listed action plan measures. West Lothian Council has developed a Draft Active Travel Plan for West Lothian, "Making Active Connections". As the title suggests, "Making active connections" is a plan to link people to places by active travel. It is not just about physical connections however - it is also a framework for mainstreaming active travel in West Lothian, and creating a culture where active travel becomes the norm for suitable everyday trips. To achieve this, it is crucial that West Lothian Council works successfully with external partners and with local communities, and "joins up" policies and projects delivered by different Services and teams across the Council. Council Officers engaged with individuals, organisations and community representatives during the development of the Draft Active Travel Plan, and this is detailed within the Plan. The Draft Active Travel Plan was also available for public review and comment during a six week period of consultation until 16th December 2015. Comments received are now being processed and reviewed. Work on the new £7.5milion primary school got underway in June and the first phase of the school will be ready for the 2016/17 academic year. A draft list of 19 names were agreed at a previous meeting of the Education Executive but the committee agreed to undertake public consultation and provide members of the community with an opportunity to have their say on what the school should be called. Although the draft list of names are included as part of the consultation, alternative suggestions will also be considered. The Proposed Plan was published on the 12 October 2015 for consultation. All documents relating to the Proposed Plan can be viewed in the . A report that was considered at the council's Development and Transport Policy Development and Scrutiny Panel (D&T PDSP) on 17 August 2015. The D&T PDSP report sets out the proposed continuation of the reduced developer contributions for public art. The Panel considered the report and agreed that it should be subject to public consultation before being finalised. Also of relevance is the update of developer contributions 2014 (public art) available through the link above. Thereafter comments will be considered and reported back to the Council Executive, who will decide if the proposed continuation of the reduced developer contributions for public art should be approved. The second part of the consultation ran from 1 March 2015 to 2 June 2015, led by SEPA on the draft information that will make up Flood Risk Management Strategies and parts of the Local Flood Risk Management Plan. The council's Development and Transport Policy Development and Scrutiny Panel met on 23 April 2015 and approved for consultation draft interim supplementary guidance on wind energy development. The guidance is 'interim' in nature whilst the West Lothian Local Development Plan (LDP) is in preparation. The supplementary guidance (SG) was prepared in response to Scottish Government's request for local authorities to produce spatial frameworks for wind energy under the new methodology set out in Scottish Planning Policy as published at June 2014. New legislation, the Public Bodies (Joint Working)(Scotland) Act 2014, requires Health Boards and Local Authorities to integrate planning for, and delivery of, certain adult health and social care services. The principal aim of the new legislation is to improve health and wellbeing outcomes. Under this new legislation, every area in Scotland requires to have a Health & Social Care Partnership which will include, at least, adult social care, adult primary and community health care, and aspects of adult hospital care. The Act requires that Health Boards and Local Authorities jointly prepare, consult and submit for approval an integration scheme to Scottish Ministers by 1 April 2015. This integration scheme sets out the key agreements that need to be reached in developing integrated arrangements. In terms of the Schools (Consultation) (Scotland) Act 2010, any proposal to change the site of a school requires a formal consultation process. The consultation involves the parents/carers/children and staff of West Calder High School, as well as other key stakeholders associated with the school and statutory consultees. Any requests for further information should also be directed to Sharon McCawley. Further copies of the consultation document are available in West Calder High School and at West Lothian Civic Centre. You can also download the proposal document [1Mb]. These two reports were approved for consultation at the Development and Transport Policy Development and Scrutiny Panel on Thursday 30 October. Consultation closed on Friday 30 January 2015. Comments should be made to the following e-mail address: schoolconsultation@westlothian.gov.uk or in writing to Development Planning, West Lothian Civic Centre, Howden South Road, Livingston EH54 6FF. In autumn 2013, Scottish Natural Heritage (SNH) approached West Lothian Council to gauge interest in acting as a case study for the production of a best practice example of supplementary planning guidance (SPG) for developers relating to natural heritage issues and the planning process. SNH wished to use this guidance to show other Scottish local authorities a simple, up-to-date template of how they could produce their own authority specific supplementary planning guidance. This guidance Planning for Nature: Development management and wildlife sets out how the biodiversity (wildlife and habitats) and geodiversity (rocks, soils and fossils) of the West Lothian area will be taken into account when considering all development proposals. It aims to help developers fully consider the wildlife and habitat implications of proposals which need planning permission. When adopted, the guidance will be a material consideration when local authority development management officers consider planning applications. The finalised guidance will be incorporated into the forthcoming West Lothian Local Development Plan. Consultation closed on Friday 13 February 2015. You may recall earlier in the summer the council advised of consultation exercises on the subject of supplementary planning guidance for developer contributions and school infrastructure in relation to the above schools. If you took this opportunity to comment you will have already received an acknowledgement letter and you can be assured that the council will have regard to this when it comes to finalise the guidance in due course. There is no need for you to do anything further. Communications regarding the consultation should be addressed to the following e-mail address: schoolconsultation@westlothian.gov.uk or in writing to Development Planning, County Buildings, High Street, Linlithgow, EH49 7EZ. The Delivering Better Outcomes consultation is now closed. The feedback received is being collated and will be discussed at Policy Development and Scrutiny Panels (PDSPs) week commencing 15 December 2014. Consultation regarding West Lothian Council's proposals to ensure equitable, quality and sustainable provision for pupils with Additional Support Needs (ASN). On 14 November 2014, Education Services commenced formal consultation on the adoption of Admission Arrangements for Specialist Provision. The aim of the public consultation in relation to Admission Arrangements for Specialist Provision is to ensure equity in the admission of children and young people to Specialist Provision, and to ensure high quality decision making regarding admission. The consultation period closed on Friday 16th January 2015. West Lothian Council adopted the West Lothian Local Development Plan on 4 September 2018 after Scottish Ministers confirmed the council could do so. It is a specific requirement of the Planning etc. (Scotland) Act 2006 that within three months of the date of adoption of a Local Development Plan (LDP) that a local planning authority must publish an Action Programme to accompany it and set out how it proposes to implement the plan to which it relates. The Action Programme must contain a list of actions required to deliver the plan's policies and proposals; identify the appropriate parties or organisations that are required to carry out the action(s); and provide an indicative timescale for completing these actions. In preparing the Action Programme the council is required to consult and consider the views of the Scottish Ministers, key agencies and those parties specified by name in the document and at a meeting of the council's Development and Transport Policy Development and Scrutiny Panel (PDSP) on 4 September 2018, it was agreed to publish the draft Action Programme for the purposes of a targeted consultation with these parties. Representations will then be considered, responded to and reported to the Council Executive at the earliest opportunity. It will be noted that this could potentially give rise to revisions being made to the Action Programme. Once the Action Programme has secured the agreement of the Council Executive it will be formally submitted to Scottish Ministers. Planning legislation gives local authorities enforcement powers to deal with a range of unauthorised land use activities. These generally involve the failure to obtain planning consent in advance of carrying out works or changes of use on land or to property, or failure to comply with a condition of a planning consent. However, the powers also extend into actions which give rise to a loss of amenity and limited powers are available to the planning authority to deal with land or property which is being kept in an untidy or derelict state and is resulting in a loss of amenity to the area. the council's procedures for dealing with any such complaint. It was agreed at a meeting of the Development and Transport Policy Development and Scrutiny Panel on 5 December 2017 to consult on revised New Development in the Countryside Planning Guidance. The current Supplementary Planning Guidance (SPG) on this subject supports the adopted West Lothian Local Plan 2009 but will require to be replaced when the new West Lothian Local Development Plan (LDP) is adopted, anticipated later in 2018. New Supplementary Guidance (SG) is produced by the council in order to explain how particular development plan policies should be applied in practice. The West Lothian Local Development Plan Proposed Plan identifies the circumstances where an exception can be made to an otherwise general policy of restraint in relation to development in the countryside. These are primarily where development can help to support the rural economy and where there is an evidenced and justifiable locational need. The SG seeks to maintain the need to safeguard the character and amenity of the countryside, protect the landscape and the most productive farmland while ensuring that any new development that is legitimised is well integrated into its surroundings, is visually and aesthetically attractive and is designed on environmental sustainability principles. This new SG has had regard to and is compliant with all relevant national planning policies which are set out in the Strategic Development Plan and the policies of the new LDP in relation to rural development. Once approved it is intended that it will form part of the statutory supplementary guidance supporting the LDP. The current guidance will not however be formally withdrawn until the new guidance has been reported to Scottish Ministers and confirmed as statutory. t was agreed at a meeting of the Development and Transport Policy Development and Scrutiny Panel on 3rd April 2017 to consult on Draft Planning Guidelines (PG) on The Vennel, Linlithgow. The council recognises the importance and sensitivity of the site which lies in close proximity to Linlithgow Palace and loch and has therefore chosen to extend the consultation period from 6 to 9 weeks. There has been ongoing redevelopment, renovation and enhancement of large properties in central Linlithgow over the last decade. The imminent opening of the new partnership centre at the County Buildings and the transfer of partnership services to this building will result in a number of properties in and around The Vennel becoming surplus to requirements. This presents a rare opportunity to consider some of the urban design issues in The Vennel area through investment opportunities. The purpose of this planning guidance is to set out the considerations which will guide and influence the future development of the area and identify the detailed criteria upon which the council, as planning authority, would assess any forthcoming proposals. To guide redevelopment of this complex site the proposed planning guidance provides an Urban Design Framework which sets the design parameters for an anticipated masterplan which would demonstrate how new development would improve and regenerate The Vennel area. Amendments to the planning guidance may be required following consultation with interested parties. Approval of the guidance will allow for the marketing and, in time, re-development of the site. The planning guidance provided is without prejudice to any further comments and decisions that may be made by the council on any formal consideration of a planning application to develop the site.